Drake Maverick narrates and says that last week, Cedric Alexander retained his title in a great match against Buddy Murphy. Tonight, Dorado will take on Kendrick in the ongoing feud between their respective factions, and Buddy Murphy will once again face Mustafa Ali. Good match. I think these two could have more heated matches down the road, but this was entertaining. After the match, Drew Gulak attacks Kalisto and Lince Dorado. Lucha House Party regroups, but Gulak escapes with Kendrick before they can attack Gulak. Clips from last week’s Cruiserweight Title match. 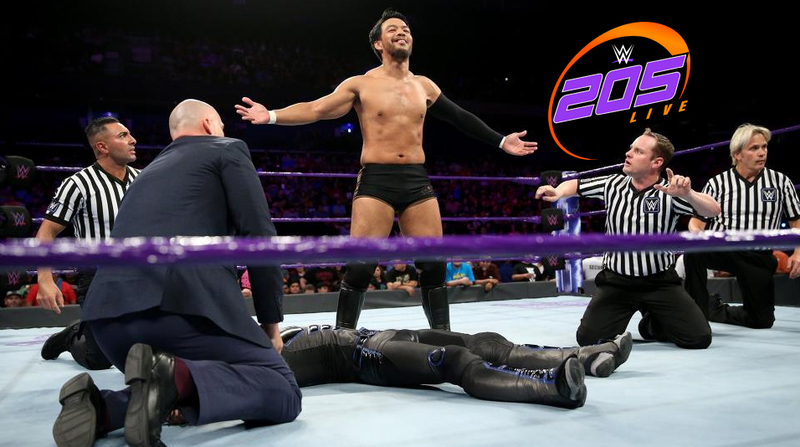 Mustafa Ali is proud of Cedric Alexander, but it also made him want to get in the ring and prove that he deserves another opportunity at the title. Buddy Murphy stands in his way, but does he have enough heart to stop Ali? TJP got on the mic during this match and beat up Keith while talking about possibly leaving 205 Live. It was interesting, and I think I kind of liked it. It’s only a matter of time before 205 Live feels the rush. Lio Rush. Dasha Fuentes asks Buddy Murphy about tonight’s match and his match with Alexander. Tony Nese responds, saying Murphy will beat Alexander next time. Murphy says that he is now unstoppable. This was another great match between these two, and I was getting more and more excited for either Ali or Murphy to get a win over the other in their third singles match. Unfortunately, Hideo Itami had other plans. Itami’s interference worked though. It made me really want to see him get beat. As for the match, there was some really good buildup and some really great looking moves. Two moves that stood out were a reverse hurricanrana that spiked Murphy, and a diving tornado DDT from the top rope to the floor (that also spiked Muphy). Really good stuff. Another good show. The finish of the main event was frustrating, but it was supposed to be, so I liked it. Even with the non-finish, Ali and Murphy once again put together some great action.